Damn It, Pass the Bread! 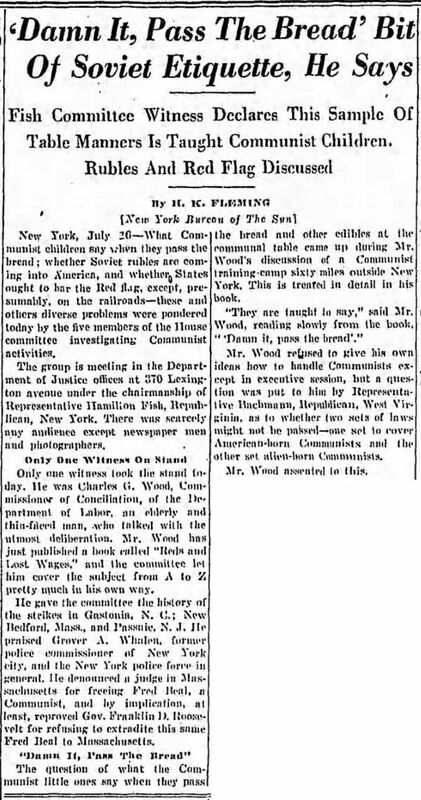 July 1930: Charles G. Wood, author of Reds and Lost Wages, when speaking before Hamilton Fish's Special Committee to Investigate Communist Activities in the United States revealed the corruption of morals that followed the adoption of communism, illustrated by the fact that children in the Soviet Union had no table manners and were being taught to say, "Damn it, pass the bread." It's pretty common to hear people say that they're so disgusted with American politics that they're going to move to Canada and renounce their U.S. citizenship... especially if candidate X or Y wins the election. But people almost never follow through with this threat/promise. But Joel Slater did. Back in the Reagan era (1987), he became so angry at U.S. policies that he decided to renounce his American citizenship. The problem was that he did this without first arranging to acquire citizenship in another country. So he made himself stateless. 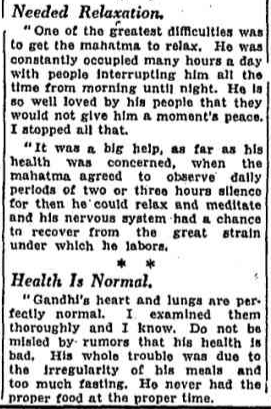 He was in Australia when he renounced his citizenship, and had assumed he would be able to stay there. But no, Australia promptly deported him to the U.S. Then, as a stateless person, he discovered that he was effectively trapped in the U.S. because he couldn't travel anywhere else without a passport. He managed to make it into Canada and Mexico a few times without a passport, but they both eventually shipped him back to the States. He also couldn't legally work without a social security number. So he became homeless, surviving on "odd jobs and the generosity of strangers." 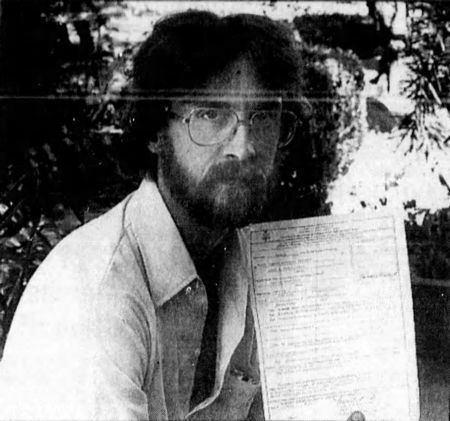 After much begging and pleading, he was able to regain his U.S. citizenship in 1993. 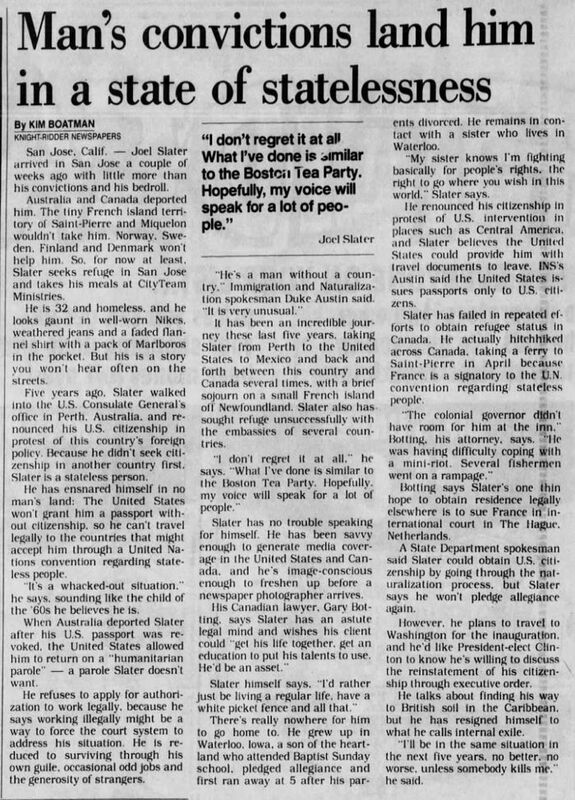 Slater showing off his "Certificate of Loss of Nationality of the United States"
Yesterday I posted about a proposal to disenfranchise the elderly. Here's a similar idea — a scheme to reduce the political power of grey hairs — but it goes about it in a different way. 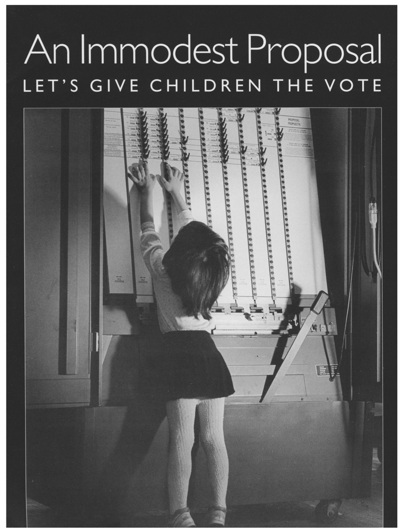 Instead of taking away the vote from the elderly, you give the vote to children. Their new political power would presumably balance out the influence of seniors, shifting state policy in new directions. This idea has been repeatedly advocated by Paul E. Peterson, professor of government at Harvard. He's argued for the idea in the journal Daedalus (Fall 1992), The Brookings Review (Winter 1993), and Education Next (Jan 2011). 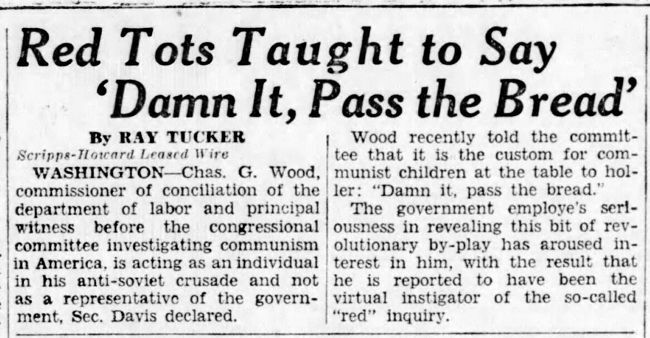 The way it would work, in practice: "parents exercise the vote on behalf of their children... parents be given the option to assign the right to their child whenever they think he or she is capable of casting it on their own. That right, once given, can never be taken back." The details that remain to be worked out: "Which parent gets the vote? What is to be done with election-day newborns? What proof of parentage is required?" It has been repeatedly discussed for over a century, especially in France, and mostly with pro-natalist motivations. The earliest proposal of this sort seems to have been made, shortly after Prussia's victory over France, by a certain Henri Lasserre, 'the universally known historian of Notre-Dame de Lourdes'. In his proposal, every French citizen, whatever his or her age or gender, is given one vote, with the (male) head of each family exercising this right to vote on behalf of his wife and each of his children. 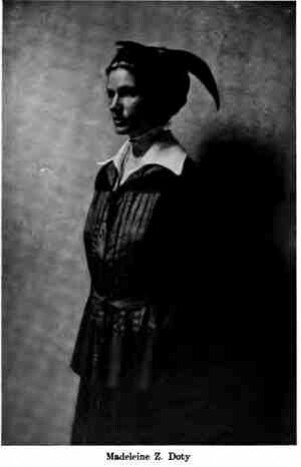 The proposal was hardly noticed, however, except by the philosopher Gabriel de Tarde, who took it over enthusiastically, as a way of enforcing a concern for the interests of younger and unborn generations. 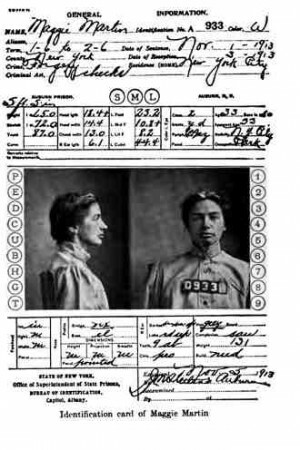 To investigate the conditions in the New York State prison system for women circa 1916, socialist reformer Madeleine Zabriskie Doty arranges to have herself incarcerated, masquerading as a real criminal, under the name "Maggie Martin." Read her experiences here, in SOCIETY'S MISFITS.